An Act Of God? Or Just Incompetence? VOTE! “Lighten the faces of the children”. Miller Valley Elementary School Principle Jeff Lane claims the directive to the artists was to make the children’s faces appear happier and brighter. A Prescott City Councilman, Steve Blair, who has a radio program on KYCA-AM 1490 has been agitating to have the mural removed completely. The images of the children depicted on the mural are taken from photographs of actual children enrolled in the school. Miller Valley is the most ethnically diverse school in the Prescott district. 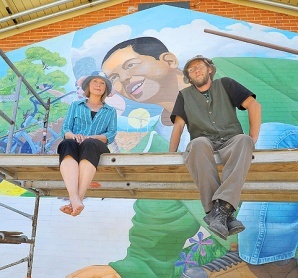 The most prominent child in the mural is Hispanic, but Blair, on his radio program, described the image as that of a black child. The nut cases and the wingnuts are gaining ground in Arizona. Is there any way to contain the idiocy, so that it doesn’t spread, or is it too late already? See AZCentral.com for the complete story.